Visit several of Guatemala’s Spanish colonial towns and modern-day Mayan villages on this 6-day tour with an informative and entertaining guide including round-trip transport from Guatemala City. You’ll learn about local history and culture amid gorgeous natural surroundings, with a boat ride across the volcanic region of Lake Atitlán. Be amazed by the diversity of daily customs, crafts and clothing in Antigua, Chichicastenango, Panajachel with Santiago Atitlán and Tikal. When you arrive in Guatemala City, your guide will greet you at La Aurora International Airport and transfer you to your hotel in Antigua. After a hearty breakfast at your hotel, embark on a half-day walking tour of Antigua with your group. Your guide will take you to see the top attractions of the city, referred to as Antigua Guatemala (Old Guatemala City) after earthquakes destroyed many of its buildings in 1773. Your 3-hour expedition takes you to Parque Central, Palacio de los Capitanes, Tanque La Union, Arco Santa Catalina and La Merced Church. Returning to your hotel in the afternoon, you’re free to purchase lunch and do as you’d like for the rest of the day. In the morning, after breakfast, depart with your group for Chichicastenango, also known as Santo Tomás Chichicastenango. This pre-Hispanic town of cobblestone streets and red-tiled rooftops, situated in the mountains of Quiche above 5,000 feet (1,500 meters), is renowned throughout the Americas for its picturesque outdoor market. Free time for lunch at local restaurant. After your guided tour, continue to the town of Panajachel on Lake Atitlán, one of most beautiful places in the world! Arise for breakfast with your group, and then take a scenic boat ride across Lake Atitlán to the indigenous village of Santiago Atitlán. On an inlet just south of Panajachel, Santiago lies between the Tolimán and San Pedro volcanoes. Return to Panajachel and free time for lunch at local restaurant. In the afternoon transfer to Guatemala City. Pickup from your Guatemala City hotel in the morning, head to airport, hop on a small plane, and set off toward the town of Flores in northern Guatemala! 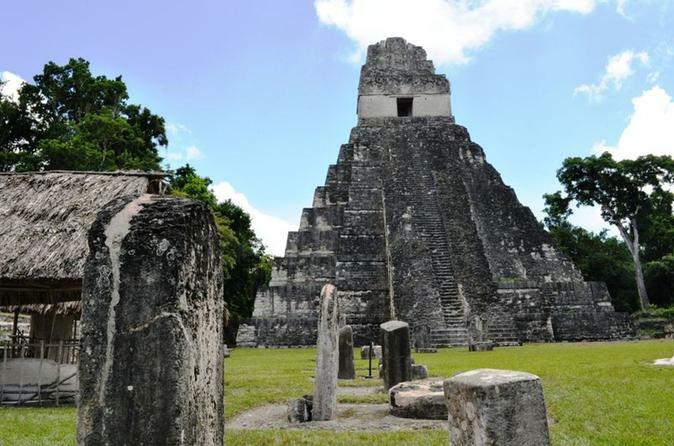 When you arrive, you'll be driven to the UNESCO World Heritage-listed Tikal National Park (Parque Nacional Tikal). With an area of more than 341 square miles (550 sq km), this national park is home to thousands of separate ruin structures scattered around, each full of intriguing history. After your tour, enjoy a delicious lunch. Then, head back to the Flores airport to begin your transfer back to Guatemala City. At your hotel, enjoy your breakfast and then get ready for drop-off at the airport for your return flight.